Driverless cars will hit America’s roadways sooner rather than later, saving millions of lives and creating higher-paying jobs throughout the U.S. economy, predicted Jason Bigelow, owner of Advanced Tire & Auto Center on Highway 35 in Aberdeen, on an interview with WJLP TV (Channel 3). During the conversation on “Another Thing with Larry Mendte,” the ASE technician--who has more than 25 years of experience as well as advanced certifications in hybrid and electronic automotive technologies--fielded questions on a raft of subjects related to driverless cars. The interview touched on timetables, safety concerns, economic impacts and even whether hackers or terrorists could use the vehicles to cause harm. The PMCM TV interview show was broadcast on April 23rd and 24th on both WJLP out of Middletown, N.J., and KJWP (Channel 2) in Wilmington, Del. It also airs online via YouTube and the Web channel AnotherThing.TV. During the interview, Mendte noted that many Americans are afraid of the technology and that California regulators have even acted to put the brakes on the progress of Google and others by insisting that driverless cars always have drivers available to take over in emergencies. To date, however, even the early iterations of Google cars appear to have impressive track records on safety, Bigelow said. The interview also explored some seemingly farfetched scenarios, such as people sending driverless cars to run errands for them, or terrorists using them to ferry bombs to soft targets. The latter is a real concern, Bigelow noted, as is the potential for the cars to be hacked. In fact, some carmakers have already dealt with hackers breaking into their Wi-Fi-connected cars, he noted. “There are hackers out there exploiting and showing the weaknesses of these cars,” he said. Ultimately, Bigelow predicted, the benefits of the technology will outweigh such concerns as manufacturers confront and solve such problems. 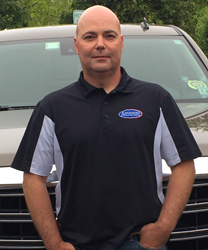 Advanced Tire & Auto Center, located on Route 35 in Aberdeen, Twp., N.J., was established by veteran mechanics Jason and Janet Bigelow in 1995. Known for its focus on diagnosing and repairing state-of-the-art, 21st-century vehicles, Advanced Tire & Auto Center utilizes 21 factory O.E. diagnostic tools paired with highly-trained technicians to perform the same level of service offered by dealerships, but at lower costs. Its comprehensive services include tire sales and service, fleet vehicle services, wheel alignments, “check engine light” diagnostics, and much more. Press contacts: At Parness & Associates Public Relations, Bill Parness, bparness(at)parnesspr(dot)com or Lisa Kreda, lkreda(at)parnesspr(dot)com (732) 290-0121. At Advanced Tire & Auto, Jason Bigelow, Jason(at)advancedtireauto(dot)com, Janet Bigelow, Janet(at)advancedtireauto(dot)com, (732) 290-7300.